Set up automatic deposits and keep money available when you need it. Visit the Automatic Deposits section of the Personalize menu to start. Grant up to four people access to your activity without them needing your password. See Grant Additional Access of the Personalize menu. If you have misplaced your RebelCard or you think it is being used fraudulently, visit the Lost/Stolen Card section of the Personalize menu to deactivate your account. Login to visit the Request Money section of the Personalize menu and let us send an email on your behalf to request additional funds on your card from a friend or relative. Welcome to the RebelCard Services Center online account management web site! Manage your RebelCard here. March 15th, 2019 the RebelCard office will be sweeping all RebelCash accounts that have not had any activity since December 31st, 2017. An e-mail went out the first week of August notifying customers of their inactive status. If you received the notice, you can bring your account to an active status by completing a transaction before March 15th. If you do that, your RebelCash will remain on your card. 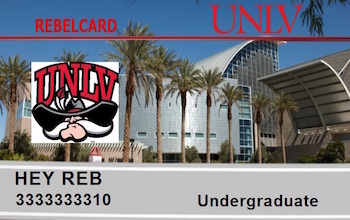 If you have any questions please feel free to contact the RebelCard office at 702-895-2351 or rebelcard@unlv.edu. IE 10+, Edge 13+, Firefox 42+, Chrome 48+, Safari 7.1+, Opera 37+.